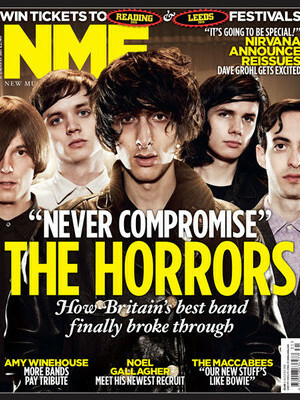 “Never compromise.” That’s the answer from The Horrors. The question? How did Britain’s best (and in our opinion, most horribly underrated) band manage to follow up the greatest record of 2009 with not only an album of equal brilliance, but crash into the Top 5 and onto the Radio 1 A-list in the process? But while ‘Primary Colours’ was, in their words, like taking a load of good E and then running down a hill, ‘Skying’ is “like running up the same hill.” There you have it. Also in this issue, Dave Grohl lifts the lid on the ‘Nevermind’ reissue and calls Kurt a “redneck”, the Maccabees spill the beans on their upcoming album (More Bowie, less LL Cool J! ), and the new wave of grunge hits Seattle as Yuck take NME on tour (and insist they’re not grunge, obvs). Plus the tributes continue to pour in for Amy Winehouse, Everything Everything threaten to let off a bomb, and Maximo Park come scissor kicking back into life. Plus all the week’s albums reviewed and rated, the essential gig guide and the best new bands you have to hear.